The sun hasn’t reached the peak of the mountains yet, but a lone room in the University of Utah football coach’s offices is lit. A long hallway of experience and tradition leads to John Pease’s office. He sits in his chair, looking at different formations for the team’s upcoming game against the University of Wyoming. Fleetwood Mac quietly plays from the mini speakers on his desk. John Pease coached at the professional and collegiate levels. During his playing days he suffered several injuries. 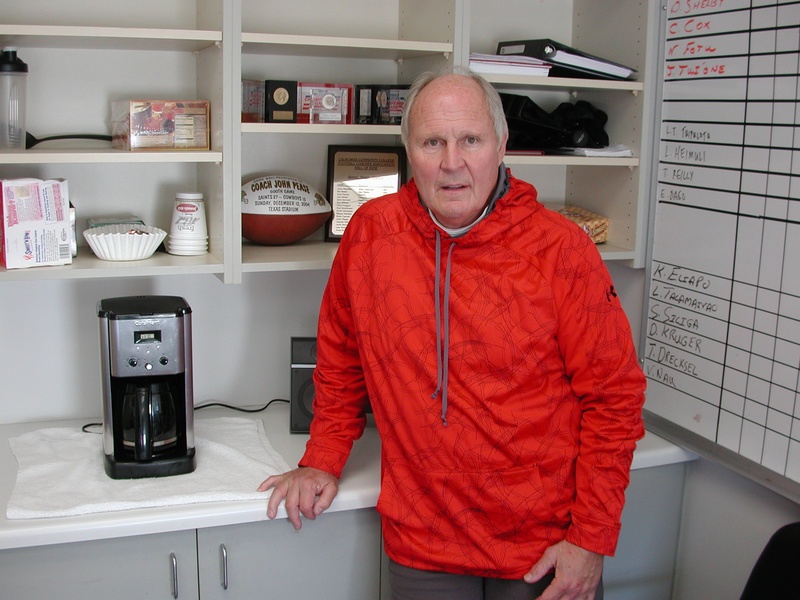 Pease was a junior college All-American halfback in 1961 and linebacker in 1962 at Fullerton Community College before playing at the University of Utah for two years. Now 66 years old, Pease is the assistant head coach at Utah and oversees the defensive line. He reaches for his briefcase and searches for something. “Where is it?” he asks. After a couple moments pass, he pulls a single sheet out of the bag; an X-ray of his lower back. A steel rod with six screws is shown in the X-ray. Pease credits running on cement for years, along with football, as the reasons why one of his lower disks has become nonexistent over the years. Even though Pease’s playing career after college was short lived, he still accumulated 11 concussions. With football injuries getting more attention in the national spotlight, the debate has attracted the attention of lawmakers and medical experts. Congress is currently investigating the long-term effects of head injuries with current and former professional football players. If there is a solution, members of Congress hope to find it soon to prevent further injuries. The real question is if a solution exists. According to Pease, there is no prevention. “Play soccer or baseball if you don’t want to take those chances,” Pease said. Roy Jefferson, 66, played at Utah with Pease and was drafted in the second round of the National Football League draft by the Pittsburgh Steelers. Jefferson played for the Baltimore Colts alongside hall of fame quarterback, Johnny Unitas. During the 1970 season, his one season with the Colts, Jefferson and his team was on the winning side of Super Bowl V.
During the later years of his NFL career, Jefferson said he tore the cartilage in his knee while playing a game. Despite the fact that he was injured, Jefferson finished the rest of the season. The trainers would use needles to inject medicine into Jefferson’s knee to temporarily relieve the pain. One year later, Jefferson retired from the league and the game he had played for so long. Jefferson agrees with Pease with the lack of prevention on the playing field. With no real prevention out there, it may be puzzling to people as to why these men put their bodies through such pain and trauma. When playing football is your career, Pease says a player makes a lifetime decision. Paul Silvestri, the head football trainer at Utah for the past two seasons, says football is a physical and brutal sport. “It’s going to continue to affect athletes down the road,” Silvestri said. The injuries can be severe, but Silvestri said he and his staff do as much as possible to prevent further damage. It is difficult to predict what the training staff does now will help the players once they are done with football, he adds. “Give them plenty of time to heal and do the best you can,” Silvestri said about rehabbing a player. Jefferson has a different take on injuries. As Silvestri said, giving the body plenty of time to recover is essential. Jefferson does not believe the players have that chance. “They train too much,” he said. Jefferson stresses the small amount of time given to recover from serious injuries. “I believe that’s why you see so many injuries,” he said. Silvestri brought up the possibility of developing arthritis after having surgery on a joint. Arthritis in retired professional football players has become a topic of study. The American Journal of Sports Medicine conducted a study on 36 of the 41 members of the 1969 Super Bowl winning team. The study took place 35 years after the winning game. During the study, the players were tested for a number of medical conditions. Twenty-four out of 36 reported having painful inflammation and stiffness. The report concluded that the players who had arthritis still had a long and fulfilling career with no apparent long-term detrimental effects on physical or mental health. During the 1987 NFL season, players were first tested for steroids. It wasn’t until 1989 that players received disciplinary action for using the drug. The ban on steroids occurred well after the playing days of both Pease and Jefferson. Steroids can have fatal consequences for users. While death from steroids does not occur frequently, the side effects of using steroids range from elevated blood pressure, harmful changes in cholesterol and an increased risk of cardiovascular disease. Pease said former teammates who took steroids during their playing days now have trouble doing normal activities such as jogging. Most of the players he knew of who used steroids are now crippled in their retirement years, Pease added. While the physical and sometimes mental aspects of playing football can be harmful, there are upsides. When Pease had prostate cancer, he credits receiving treatment from the John Hopkins Medical Institute to his football connections. “You get the best care,” he said. According to the NFL Players Association, 2.4 percent of college players become professionals in football. Out of 100,000 people who play high school football each year, only 215 will ever make an NFL roster. That is not to say the injuries will be less severe if a player does not play professional football. Another possibility is having a career-ending injury occur before the chance to even play in the NFL. “Hopefully they have their degree and they can find something else in life,” Pease said. Jefferson, whose left knee has been operated on three times, will have to have it replaced. His right hip will also need to be replaced. The drug Vicodin that Jefferson mentions is used specifically to relieve pain. Vicodin, along with several other painkillers, are used excessively by NFL players. Most notably, in 1996, Green Bay Packers quarterback Brett Favre, admitted to being addicted to Vicodin and was in treatment for 46 days. Pease stresses that players make the choice to play football and they accept the risks. His wife, Chris Mickelson, has told her husband that football players have spent their whole career ruining their bodies, and should stop complaining. Through all the injuries Pease has seen during his years of coaching, he still has strong feelings about the game he fell in love with long ago. On a warm fall Saturday morning a handful of Burmese refugees gather outside of the International Rescue Committee building in downtown Salt Lake City. They are meeting to catch the light rail system of public transportation, TRAX, across the street on 400 South to go to a University of Utah football game. The university donates the tickets to the IRC. This is just one example of an activity refugees experience when arriving in Utah. Throughout refugees’ first few months of resettlement in the United States the IRC provides activities and recreation for the foreign families and individuals for a number of reasons. “When people are spending time with Americans and feeling comfortable it avoids the awkwardness or fear rather than giving them a sense of an outsider,” said Jonathan Codell, acculturation PORTAL coordinator at the IRC located in Salt Lake City. Located at 231 E. and 400 South, the IRC, is an organization that provides refugees with aid throughout the resettlement process. The IRC works with refugees for the first six months of their residency and helps to offer essentials such as food, shelter and employment. According to the United States Department of State a refugee is a person who may be fleeing from their country to escape from war or persecution on account of race, religion or nationality. Codell said the IRC brings certain cultural groups to at least one activity per month, but typically it is more than that. Other activities the IRC offers to the groups is trips to the parks, mountains, and bringing them to the library for educational purposes. A piece of the big picture the IRC wants to reach by providing these outings is to relieve some stress of the movement procedure for the refugees. “The resettlement process is dramatic,” Codell said. Nyaw Paw, 33, a Burmese refugee who has been in Salt Lake City for two months feels getting out and being with Americans helps the process. Paw said through Han Win, a Burmese speaking IRC interpreter, that she feels happiness, a sense of freedom, stress relief and enjoys just being part of the American culture. Paw grew up in Burma, but moved to Thailand with her family when she was 6. There she was not allowed to get out and be involved with the activities like the IRC provides. Paw finds the freedom she has discovered in the United States lets her do anything that she wants. Within the activities the IRC reaches out to makes sure the refugees feel more welcome and feel home in the United States. A key for resettlement is introducing places around the homes of refugee is a key for resettlement, Codell said. Even something as small as a park close to home where they can go have a picnic will help he said. He feels showing the refugees places to go does help, especially, when he sees a refugee doing this on it own. This is what the IRC is aiming for. An American football game is something many refugees have never seen. The only football game they are familiar with is soccer. Codell admitted that seeing American football can be strange and maybe confusing to the refugees. However, it allows them to be out there with the public, which benefits the resettlement process. “This is a way for them to see what being in the U.S. is all about,” Fishbein said. Bringing activities and recreation is only a small part of what the IRC does, Codell said. However, it does show where the refugees can access resources when they want them. It also brings camaraderie throughout the groups.